We're always very grateful to have some extra 'helping hands' to support our local staff in running the school, and we welcome both short and long term volunteers. We have a well established volunteer programme that allows all volunteers to be quickly integrated into the ongoing programme. What do volunteers do in Cambodia? Short term volunteers typically support our local staff, either in various classes such as English, arts, sports, music and dance or with our Breakfast co-ordinator, Rhi, helping her to tend to our on-site garden and serve breakfast to our students. Long term volunteers are more able to utilise their own skills, and can get involved with anything from building maintenance, to marketing. How can I apply to be a volunteer? Helping Hands's parent organisation, Globalteer, organises volunteer placements on our behalf. 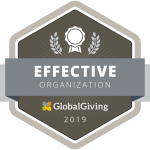 Please click the link below to visit Globalteer's website and apply to be a volunteer at Helping Hands. John from the UK volunteered as a classroom assistant for 2 weeks in April 2018. 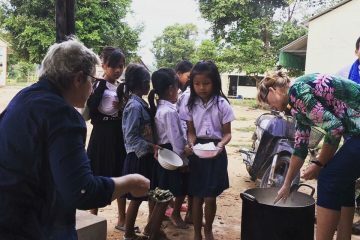 Lee Ann, from the USA volunteered with Rhi on our Food and Farming Programme for 3 weeks in November 2017. "This country and area was new to me and I was surprised at so many things. The local people are warm and welcoming, the country itself is absolutely gorgeous. The other volunteers and the staff were all friendly and helpful. By expanding the garden and planting we saw the efforts growing. This was a very rewarding experience. I cannot say enough good about the organization, and the flexibility."